Any manuscripts submitted to the SPring-8/SACLA Research Report shall not be submitted to any other journals. 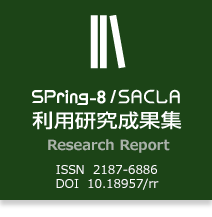 In general, the articles submitted to the SPring-8/SACLA Research Report are recommended to be published under the Creative Commons (CC) license. SPring-8/SACLA Research Report (hereafter, Research Report) will be published under the Creative Commons (CC) license as of September 2018, and authors can select whether or not their manuscript will be published under the terms of the CC license. ・The terms of the Creative Commons Attribution 4.0 International (CC BY 4.0) license will be introduced. CC BY: The authors’ agreement to publish the manuscript under the CC BY license allows the transformation and secondary use of the manuscript for commercial purposes by users with appropriate credit (name, title, Vol. and No. of Research Report, page, etc. ), although the authors own the copyright. You express their approval that others may download, reuse, transform, copy, and distribute the manuscript as long as appropriate credit is given. Users who wish to reuse and transform the materials are free to do so without obtaining permission from the authors or JASRI. Note 1. You need not transfer the copyright of the manuscript to JASRI. Note 2.　 will be displayed on your paper in the SPring-8/SACLA Research Report. Copyright of manuscripts submitted for publication in the SPring-8 Research Report shall be retained by the Japan Synchrotron Radiation Research Institute (JASRI). Regarding any figures, tables, etc., that are quoted in the manuscript which have been taken from another work, the author shall personally obtain permission from the copyright holder, as well as noting the work as a cited reference. For the submission of a manuscript to SPring-8/SACLA Research Report, please refer to the template and sample .